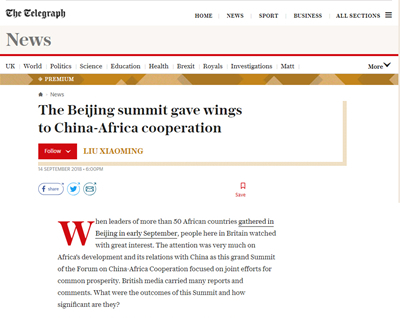 When leaders of more than 50 African countries gathered in Beijing in early September, people here in Britain watched with great interest. The attention was very much on Africa’s development and its relations with China as this grand Summit of the Forum on China-Africa Cooperation focused on joint efforts for common prosperity. British media carried many reports and comments. What were the outcomes of this Summit and how significant are they? First, the Summit highlights the perfect match between the development strategies of China and Africa. The summit rolled out eight major initiatives on industrial promotion, infrastructure connectivity, trade facilitation, green development, capacity building, health care, people-to-people exchange, and peace and security. These will be the focal points for China-Africa cooperation in the next three years. The goals of these initiatives match those of the Agenda 2063 of the African Union, the 2030 Agenda for Sustainable Development of the United Nations, and the national development strategies of African countries. They also echo the values and priorities of the Belt and Road Initiative. Like concentric circles, Chinese and African efforts to implement these agendas and initiatives hinge upon a centre point: the strengths of China and the advantages of Africa complement and reinforce each other. These efforts in turn enable African countries to take advantage of the opportunities and successes of the Belt and Road Initiative to achieve industrialisation and modernisation as well as economic and social transformation and integration of the African continent. Contrary to criticisms that China in its cooperation with African countries does not take into consideration the reality on the ground, China has always given priority to the needs and wants of Africa as a true friend and equal-footed partner would do. A good example is the Mombasa-Nairobi railway. The facility from the colonial period is becoming a bottleneck in the development of Kenya and holding back pan-African connectivity. China helped Kenya build a modern standard gauge railway linking Mombasa and Nairobi, which boosted Kenya’s GDP by 1.5 percent and cut regional logistics costs by 14 to 40 percent. This is a project close to the heart of the local people because it addresses their real needs. Second, the Beijing Summit has upgraded the win-win cooperation between China and Africa. In its cooperation with Africa, China has always been a sincere friend who focuses on results and never sacrifices the greater good for material interests. These are the principles that underpin the eight major initiatives adopted at the Beijing Summit and help ensure that the projects thereunder are first of all concrete and substantial rather than being mere show pieces. From trade and economic cooperation zones to key connectivity projects, from greater imports from Africa to e-commerce cooperation, every penny invested should count. High quality is another priority. Economic and social return and debt sustainability are always high on China’s list in its cooperation with Africa. China emphasises high-efficiency development and helps Africa with infrastructure improvement and capacity-building in order to attract investments. At the Beijing Summit, China pledged to support investment-construction-operation or other models of infrastructure development in Africa as well as set up a centre of China-Africa innovation cooperation and help Africa with human resource training. These concrete measures will enable Africa to improve its capacity for independent and sustainable development and achieve a virtuous cycle of economic and social development. The top priority is people. A large number of the outcomes of the Summit are in the areas of poverty alleviation, healthcare, people-to-people exchange and environmental protection. They focus mainly on the wellbeing of the African people, especially young people, women and children, and are aimed at delivering more tangible social benefit. Third, this Summit has pooled positive energy for international development and global governance. An African saying reads, if you want to go fast, walk alone; and if you want to go far, walk together. China-Africa cooperation is aimed at going far; it is open and inclusive. At the Beijing Summit, China called on the international community to pay more attention to Africa, increase investment and support the peace and development of the continent. With the consent of the African countries, China-Africa cooperation is open to third parties from outside Africa who want to share the opportunities and achieve win-win results. China does not seek a sphere of influence for itself nor to export its model. As one of Africa’s global partners, we believe that Africa needs more diverse partners, who in turn should respect the sovereignty of Africa and honour their commitments. The Beijing Summit is a timely response to the surging trend against globalisation and multilateralism, and the rising challenges to international cooperation and global governance. President Xi Jinping proposed at the Summit to build a China-Africa community with a shared future that features joint responsibility, win-win cooperation, happiness for all, common cultural prosperity, common security and harmony between man and nature. This proposal calls on China and Africa to pool their strengths to work for common development, and oppose exclusion so as to contribute their wisdom and solutions to global governance. Nelson Mandela once said, "We stand at the dawn of an African century, a century where Africa will take its rightful place among the nations of the world." The world is experiencing changes unprecedented in a century. In this world, China's development will create more opportunities for Africa and Africa's development will add new driving forces to the development of China. China-Africa cooperation will also open up more prospects for partners from all over the world. The Beijing Declaration and the Beijing Action Plan adopted at the Summit has given wings to the win-win cooperation and common development of China and Africa in the new era. China-Africa friendly cooperation will produce more golden fruits for the Chinese and African people and the people of the world.